As the proportion of people over the age of 65 is set to double from 16 per cent of the population in Poland to 33 per cent by 2050, making sure senior citizens are valued and included in society is a growing issue (Central Statistical Office). Working with older people has been a core part of Polish Red Cross activities for years. Through its senior centres, people can come to meet, be supported, and join in stimulating intellectual and physical activities. This is especially important for those who might otherwise be isolated, as social interaction and being part of a community is vital to wellbeing. 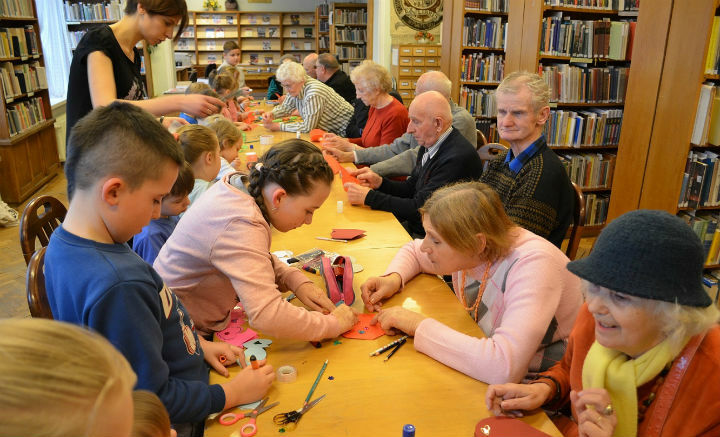 SeniorON is a project taking place at these centres, which specifically aims to increase people’s quality of life through interaction between young and old generations. Over 2,500 people have so far come together for events organised by Polish Red Cross branches across the country, from Pomerania to Silesia, Lubuskie Province to Podlasie Province. Some of the workshops look at the history of each region, while others teach participants about nutrition, and yet others are practical lessons in floristry or first aid. “I’d like to see these meetings take place throughout the year,” says Ms Basia, a 68-year-old participant. “I enjoy spending my free time getting to know the others better. Everyone brings their own talents and ideas, so each session is unique,” she explains. These collective activities allow for a positive understanding of ageing to develop, especially amongst younger people, while enabling those in later life to actively engage in society. The workshops are a space for mutual learning. Older people contribute their irreplaceable experience and knowledge, and younger participants bring inspiration and energy to the sessions. Everybody involved is an important part of the group, and the bonds created strengthen the local community. Funded by the PZU Foundation, the pilot stage of this project will be completed in March 2018.